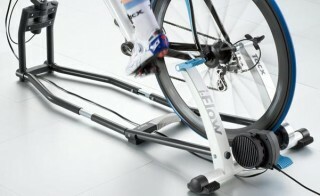 The i-Flow is another Tacx virtual reality turbo trainer. This is a very popular trainer with a frame that is designed to bounce a little when you ride, offering a little more realism. This trainer used to come with the virtual reality steering frame as standard, and most of the retailers still sell it this way. However, before you purchase you should check if the i-Flow comes with a normal Skyliner front wheel support or with the virtual reality steering frame. This special steering frame allows you to fix your front folks into the trainer and monitor movements of the handlebars, meaning you can actually steer the bike in the virtual environments. 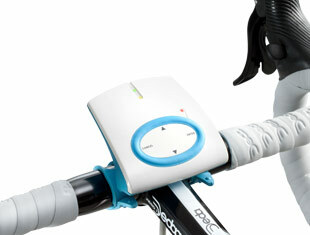 This trainer comes with the Tacx Trainer software 4, Basic as standard, but optional upgrades can be made at any time. It does however include a multiplayer web racing licence so that you can race against others. The i-Flow uses an electro-magnetic braking system, which is not quite as high resistance as some other motor brakes. 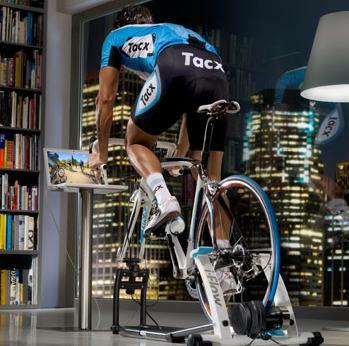 Also, unlike more expensive virtual reality turbo trainers, such as the i-Genius turbo trainer, it does not drive the back wheel to simulate downhills. However, you do feel the added resistance that you would feel in real life due to increased wind resistance, the road surface, and on inclines, which for most of us is what we are after in a good turbo workout.